Packers QB Aaron Rodgers to appear on Jeopardy! Packers QB Aaron Rodgers will appear on Celebrity Jeopardy! on May 12. 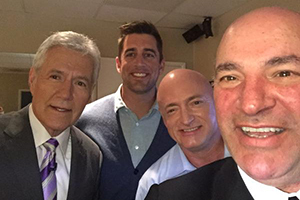 The episode was taped on Tuesday, and Rodgers will appear along with Shark Tank star Kevin O’Leary and retired astronaut Mark Kelly. O’Leary tweeted the accompanying photo, which includes Jeopardy! host Alex Trebek, after the filming of the episode. Rodgers has often mentioned in interviews he’s a fan of the show and has watched it for years.